The President’s Award is not an annual honor, but given out whenever the current association president feels a member has gone above and beyond with contributions to the association. “This award has not been presented in many years, making it extremely prestigious. It recognizes extremely high commitment to BSCAI,” says Jim Harris Jr., 2018 BSCAI president. The 2018 President’s Award was given to Parker Moore of IH Services, Greenville, South Carolina, for his efforts in updating the association’s certification programs. Moore has rewritten the manuals and made them available digitally. In addition, thanks for Moore’s efforts, BSCs can take the tests online. “Parker’s efforts and overhaul of the program have not gone unnoticed,” says Harris Jr.
More than 10 years ago, Taylor Bruce, president of IH Services and a BSCAI past president asked Moore to update the CBSE and RBSM exams. “Little did I know that this would be the start of this journey,” says Moore. 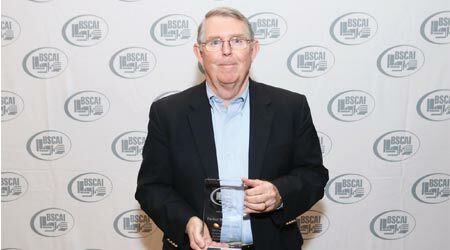 This award is named after the prominent former association executive vice president and is presented to a BSCAI member who has made outstanding contributions in furthering the programs and image of the association, and the building service contracting industry. This year’s winner is Yasser Youssef, president, The Budd Group, Winston Salem, North Carolina. “I am sincerely grateful for the recognition and the support I have received throughout the years from BSCAI, friends in the industry and my colleagues at The Budd Group,” says Youssef. Youssef joined The Budd Group in 2004. Having come into the contract cleaning industry with a background in staffing, he wanted to learn more about challenges specific to BSCs. He immediately became a member of BSCAI and just six years later was elected to the board of directors. He served as president in 2014. Even after his presidency, Youssef didn’t ease up his involvement. He remains heavily committed to the association and its values. This award recognizes a building service contractor with a cleaning program that helps reduce the levels of allergens and asthma triggers in the indoor environment. A Cleaning for Health program consists of policies, procedures and training that emphasizes the impact on the health of building occupants and staff. It also includes equipment that reduces building contaminants and minimizes environmental impact. The award is presented by ProTeam and its winner was determined by a separate judging panel. This year’s winner is 4M Building Solutions, St. Louis. The underlying mission of 4M’s business is to create a safe, healthy environment for their clients’ stakeholders whether they be employees, tenants, or customers. A lack of cleanliness not only reflects on 4M’s reputation and that of their clients but can contribute to a number of health issues. 4M’s commitment to Cleaning for Health is evident in the approach the company takes to its cleaning programs. Starting at the root by using products and procedures that are certified by Green Seal, GreenGuard and the Carpet and Rug Institute, and encompassing all those efforts with extensive training to ensure the cleanest and safest environments is something 4M is proud to do to in order to keep each person staff members come in contact with as healthy as possible.